At Ciopinot’s we are family. Who we are… We are a second generation restaurant family who grew up around fishing boats and a family Seafood Restaurant. Our decision to open a Seafood Grille and Oyster Bar in downtown San Luis Obispo, California was driven by a niche that no one had filled. In addition, we decided to focus our extensive wine list on white and red Pinots from around the world. We found that red Pinots paired delightfully with our Cioppino and white Pinots paired very well with Oysters from our Oyster Bar. This is where the name “Ciopinot” originated. We have a very customer friendly attitude at Ciopinots. 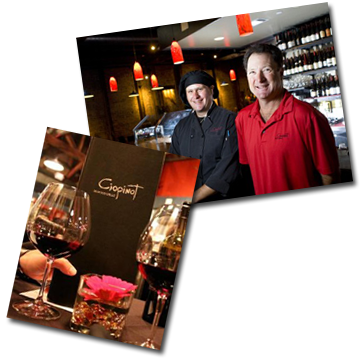 From the time you enter you are greeted with warm welcomes, no split plate charges, no automatic tip charges for large parties and NO corkage fee! Please join us for superb food, fabulous wines, great service and a warm and friendly attitude.